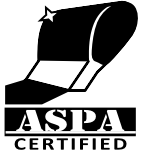 Get ASPA Certified. Over a thousand certified printers and artists worldwide. When owners and managers of screen printing firms have a job opening in their art department, they often have difficulty finding qualified applicants. Entry level graphic artists typically do not have the specific graphics art training that is required for screen printing. Moreover, many experienced graphic artists lack the specific knowledge and/or training to produce and prepare art for production in a screen printing shop. To fill this need, American Screen Printing Association developed the Certified Graphic Artist—Screen Printing (CGA-SP) certification program. It is modeled after ASPA's successful Certified Screen Printer (CSP) program. In addition to providing screen printing employers with better qualified job applicants, ASPA's Graphic Artist Certification program can provide additional employment possibilities for graphic artists who would like to work in the screen printing industry. ASPA certification sets a competency standard for graphic artists engaged in or planning to work in the field of screen printing and provides recognition to graphic artists who demonstrate their knowledge of the screen printing craft. The ASPA CGA-SP exam was created by graphic artists with years of screen printing experience and is authorized by American Screen Printing Association, Inc.
Get a copy of your ASPA Certified Graphic Artist (CGA-SP) Certificate of Achievement. It is an 8.5" X 11" size document. Custom made with your name and date of award. It is a PDF file download that you print and frame. Only $8.00. Allow 8 hours for preparation of your Certificate. Show everyone that you're a graphic arts professional. 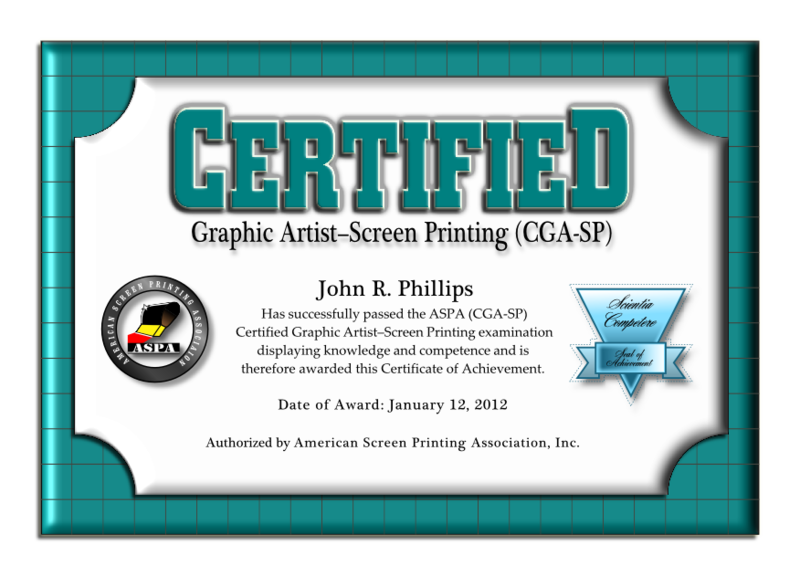 Display the ASPA Certified Graphic Artist badge on your website. ARE YOU ASPA CERTIFIED? PLEASE TAKE OUR SURVEY.